A pair of beautiful sandy crescents fronting the Polo Beach Club and the Fairmont Kea Lani. In a nutshell: A pair of beautiful sandy crescents fronting the Polo Beach Club and the Fairmont Kea Lani. Minuses: Can get crowded with resort guests & cabanas. A pair of beautiful sandy crescents join to form this beach. 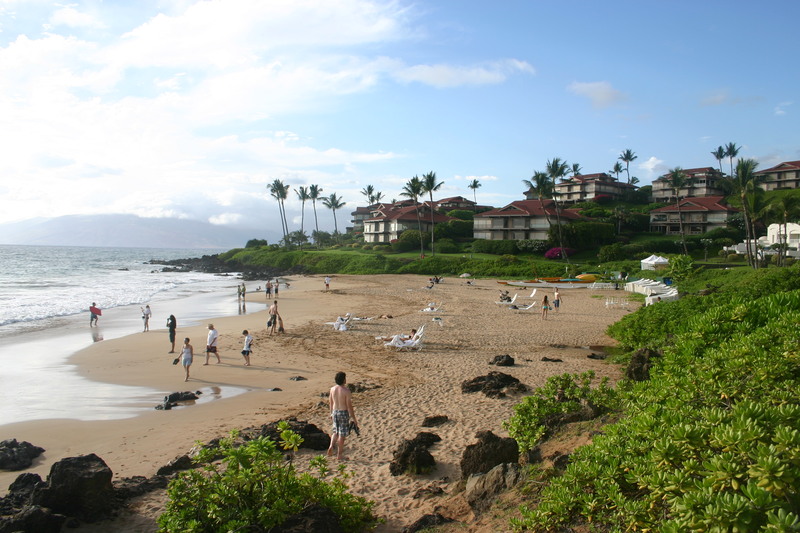 The south end fronts the Polo Beach Club and the north side the Fairmont Kea Lani hotel. At times, the north end becomes crowded with Kea Lani guests, cabanas and lounge chairs; the south end is usually uncrowded. – Take a relaxing stroll through the opulent Kea Lani grounds and gardens after playing at the beach. – Finish your stroll at Nick’s Fishmarket for a romantic dinner. – Nick’s and the hotel lobby both have very enjoyable open-air bars to sip a mai tai overlooking the Kea Lana gardens. – Continue the romance with a moonlit stroll along the beach. A small grassy park with showers, bathrooms, picnic tables & BBQs is removed from the beach and resort. The tables and BBQs are infrequently used because they don’t have much of a view and feel sandwiched between resort buildings and the parking lot. Plenty of parking and real easy access. Polo beach got renamed in a sales brochure for the resort, probably because one of the common names prior to re-branding was a bit less appealing: “Dead Horse Beach.” The full name of the beach, “Ke One o Polo” is, however, quite accurate when translated – “The sand is not thick.” There are plenty of rocks poking though. Snorkeling is excellent during calm seas around the rocky point to the north end of the beach. Boogie boarding is good when a south swell comes in. Sandy entry and gentle slope makes swimming and playing in the water a pleasure, but during large swells you are advised to avoid this beach as dangerous rip currents are known to form. Facilities: Showers, bathrooms, picnic tables, BBQs, no lifeguards.